We have tried the golden master of iOS 11 on an iPhone 7 Plus and now know the final features. A lot of things are curiously reminiscent of Android and some elements even seem to work better on our friendly competition. But let's take a closer look at the innovations to be found in iOS 11. Apple is envied by Android users for the availability of updates alone.. Even the four year old iPhone 5s still gets the new features of iOS 11 as well as security updates. In the Android world, only exceptions like Google can keep up with the Nexus 6 or Samsung with the Galaxy Note 4, which are still provided with security patches after their release in 2014.
a dock with app quick-starters. Open multiple apps in parallel, including drag and drop for text and images. Apple's voice assistant Siri is now supposed to control and search apps, recognize bookings in e-mails and automatically create appointments based on the data. The idea is that you should be able to use Siri to keep track of everything and always reach your destination on time. While the latter, in combination with Apple Wallet, is a great help on private and business trips, the in-app search with Siri is not yet working so well. 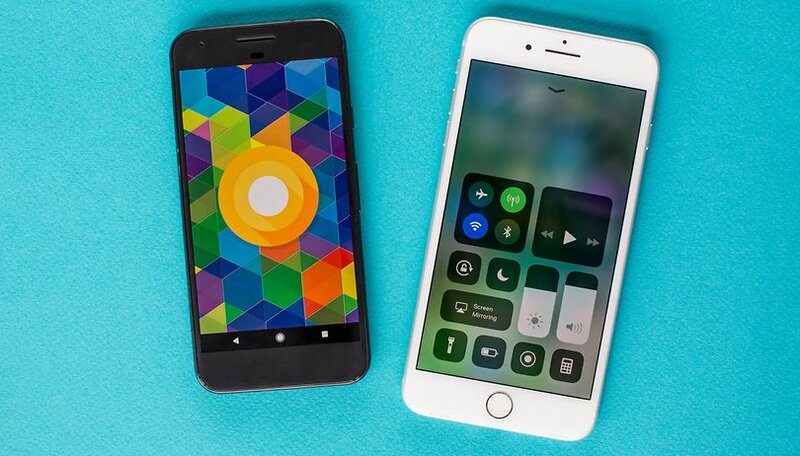 Google Assistant to replace Siri on iPhone 8? Instead of Apple Music I prefer the streaming service Deezer, but Siri isn't be able to search it yet. Whether this is due to the operating system restrictions or a poor implementation of the app developer, I can't be sure. Google Assistant has no problem with this and responds to the "Play Music" command by opening Deezer, not Google Play Music. In our test of Google Home, the music control presents itself as the best feature of the Google Assistant. The same applies to many other third-party services: Google always gives me the choice to change the default values. The open philosophy of the ecosystem, which is already familiar from the Play Store, is continued with the digital assistant. Apart from that, the similarities of Siri and Assistant are obvious: You start apps, make calls, dictate messages and send them with the messenger of your choice. You can ask localized search queries and find the nearest ATM. You can set timers or dim the lights in the bedroom. Or you can change the radio station in the living room. Hi there smart home. You can now play your music stream on multiple AirPlay speakers simultaneously. This is how Apple is catching up with Chromecast, which was already multi-room-capable. However, I consider the implementation via the control center on iOS to be more successful. Android has so far relied on a mixture of quick-setting tiles and attached notifications. In addition, the Pool Cast/Google Home compatible speaker is slightly smaller than the AirPlay counterpart. Devices with iOS 11 recognize when you are in the car. Calls are then rejected with a friendly SMS message informing the caller that you are currently at the wheel. The mode can be activated either automatically through the Bluetooth connection, or by analyzing your current movement profile on the iPhone. A similar feature in Android can only be simulated with the Google app Android Auto. App discovery is the basic principle for purchasing from the App Store: if Apple wants to encourage iOS users to buy products, it must provide developers with the ability to give exposure to their apps. Thus, not only is the catalog and exploration of apps much more attractive, but each app’s description page has been modified to be more descriptive. This includes videos that play automatically and more space for reviews, among other improvements. Video games have their own tab at the bottom of the App Store and can be accessed more quickly than before. The Today section replaces Featured and highlights new selections and special offers. In the App Store settings, an advanced option proposes to uninstall apps that are rarely used in order to free up space. This ensures that the data is saved so that the user can access it again and continue to use the app as before it was removed. With the Lollipop update, Android notifications allowed the lock screen to be useful. iOS needs to get up to date with Android because since the Nougat update, these type of notifications can be managed directly on Android devices. iOS 11 already displays notifications in chronological order (and not in app order), given that it shows the most recent notifications, and in theory, the most urgent ones first on the lock screen. The other notifications must be deleted from the bottom up. On iOS 10, you could see the full list - a feature that quickly became troublesome for users. The notifications setup is done independently, in a rather expansive section of the settings. On iOS 11, you can decide whether an app's notifications appear permanently in the history, if they appear from time to time, or if they shouldn’t appear at all. With iOS 11, the control center is no longer a hindrance. You can now customize its features; the unique and rigid design has become more flexible thanks to the different panels, which can be controlled via Force Touch. In the settings, you can choose the icons that you want to appear on the screen. It’s been rumored that one day, Apple will finally allow app developers to have a panel that appears in the control center. This would allow them to create mini-apps to use when the phone is locked, which would be handy for Smart Home apps or assistants developed by third parties. A file explorer... is available! Apple has also opened its OS for file browsing, and wants to offer an external file browsing system with Files App. We aren’t talking about navigating in the iPhone’s local file system. It's more about moving your files from the iPhone to the cloud and vice versa. A comprehensive search and categorization make it much easier to locate your documents on all your devices, using iCloud or other cloud service providers. Could it even be possible to integrate Google Drive? Photos and videos will be compressed in new formats. To replace JPEG, Apple will use HEIF for images and HEVC for videos. Both will halve the file size without compromising on quality. If you copy your files from your iPhone, during the transfer, they’ll automatically convert to a format that can be recognized by the destination device. However, you still have the option of disabling this compression mode and real-time conversion. Unfortunately, the photos saved in this way are no longer compatible with Android devices. If you send one of these photos with a messenger (WhatsApp, etc. ), the chat client will do a (lossy) conversion behind the scenes, making sure your friends and family will be able to see them. What about ARKit and Animojis? App developers are still working diligently with the brand new Augmented Reality framework ARKit, which was introduced shortly before Google's counterpart ARCore. A number of AR applications that were previously reserved for the more academically interesting project Tango will soon become available to consumers. New, immersive smartphone applications are just on the horizon, especially with the borderless iPhone X. Thanks to its FaceID sensor technology, one of the exclusive selling points of the iPhone X comes in the form of Animojis. Those Emojis mimic your facial features in near real time. The recording will then be received by your opponent in iMessage; the videos will also play on older Apple devices. Having done these first quick tests of iOS 11, we begin to see what Apple is aiming to do: optimize ease of use, and obviously to position itself above the rest. However, the notifications system remains inferior to Android Nougat’s, even despite the clear improvements from iOS 10. And the control center is also inferior to Nougat’s fast settings. For a while now, these settings could be configured to the user’s preferences, not to mention the fact that they are open to other suppliers. I prefer Android to iOS. I do however like the change to HEIF and HEVC. Apple's market power could ensure that Android and Windows also quickly adopt the format.. If they consolidate worldwide, this could reduce data consumption on mobile, and if that doesn’t have any effect, at least these formats will improve image quality. HEVC recording is probably the most interesting feature to me! Bring that to android please! Just had a look at my videos, one is 150MB for a 98 second 720p video! When did AndroidPit turned into ApplePit?! I would love to see those interesting people to write unbiased reviews about apple products too. Because why shouldn't? I would again fall in love reading your articles. Trust me its been a long time this website is on my daily checks. Appel will always be a good mobil for kids. Don't need to "think" about nothing, it's "OK ORE CANCEL" No needs to explain, you all know what I mean..